HANK PHILLIPPI RYAN: Breaking News! It's release day for our darling Red Susan's new book--I mean, Maggie Hope and Eleanor Roosevelt! I swoon. And so do the critics: PW calls it "enthralling" and Kirkus "enchanting." But first--inside a fabulous party that only our dear Susan could create. 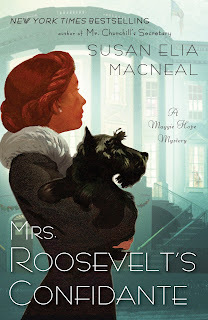 SUSAN ELIA MACNEAL: To celebrate the publication of MRS. ROOSEVELT'S CONFIDANTE, Maggie Hope #5 — which takes place in December of 1941, during Prime Minister Winston Churchill's historic post-Pearl Harbor visit to the Roosevelts' White House— we had our own FDR-inspired "Children's Hour." And we pitted (pun intended) the two great leaders' very different versions of the classic Martini cocktail against each other. So, let's see who wins the Great Martini Smackdown of 2015, shall we? I mixed both Churchill's more pristine ("bow in the direction of France" instead of adding vermouth) and FDR's vermouth and olive-brine heavy Martinis. Husband Noel, and our guests, Rob, Victor, and Leila, were encouraged to be candid in their reactions to each cocktail. Winston Churchill's enjoyment of spirits was legendary, but by all accounts, he preferred his drinks unmixed. According to various accounts he was appalled at the copious amount of vermouth in President Roosevelt’s martinis, but drank them agreeably, in the name of diplomacy. Shake gin in a container half filled with chipped ice. Garnish with lemon peel, if desired. NOEL: This is a really good cocktail — it would be great in the summer. You can really taste the gin but also taste the lemon. Very refreshing. ROB: I love the simple simplicity of it. SUSAN: It's elegant. Tastes like the martini at Dukes Hotel, in London. VICTOR: The Churchill Martini is very European — "We don't care about driving later — we want alcohol now!" It has a good aftertaste, too — juniper and citrus. ROB: It's nice to look at the lemon rind floating around in it. SUSAN: Rob, how many have you had? ROB: Hey, this is my first drink! LEILA: It's like a tickle in the throat, but a nice one — smooth and not harsh. SUSAN: It almost tastes like a Gimlet. NOEL: Is that the one with the little pickled onions? SUSAN: No, that's a Gibson. A Gimlet is gin with lime and sugar syrup. It was Betty Draper's cocktail of choice on Mad Men. But that’s another blog post....Or at least another party. President Franklin D. Roosevelt did always mix drinks at Children’s Hour and reportedly enjoyed making martinis. As far as I can tell there’s no exact recipe, but we know from his personal secretary Grace Tully’s memoirs that they were heavy on the vermouth (which was considered old-fashioned) and he was also known to add a few drops of Pernod, orange blossom water, or olive brine for flavor. Here’s my best approximation of his martini. Enjoy! Shake gin, vermouth, and olive brine in a container half filled with chipped ice. Strain into chilled cocktail glasses. ROB: I do like a Dirty Martini! Did President Roosevelt invent the Dirty Martini? SUSAN: I don't know if he invented the Dirty Martini, but he's reputed to have made and served them — much to Churchill's horror. FDR really liked to garnish, apparently. ROB: Well, I love it. It has a richer and plumper taste than the Churchill one. SUSAN: I like the vermouth and gin together. It's a cocktail for heaven's sake, not just cold gin! VICTOR: Yes, I can see how this was more popular with the American palate — less alcohol, more ingredients. It's heavier. NOEL: This is more of a winter cocktail. LEILA: This is not a Dirty Martini — this is more like dirty laundry. Yuck. SUSAN: I like it! More olives, please! SUSAN: So, which do you like best? NOEL: I think Churchill's for summer and Roosevelt's for winter. SUSAN: That's a very politic answer, dear. VICTOR: I vote for the Churchill. And I'm taking a taxi home. SUSAN: I must admit I like any excuse to eat olives. I'm going with Roosevelt's. LEILA: Oh, olives in gin are yucky. I pick Churchill's. ROB: Must we choose? Can't we just enjoy both? I pick both! SUSAN: And so the Churchill Martini wins — by one vote! Cheers, everyone! HANK: I'm a no-vermouth girl myself. And a twist. And a pre chilled glass. (I always ask for the olives on the side, in case there's no other food. ) And if you want to chat with Susan and me in person? We will be at the wonderful Jabberwocky Bookstore in Newburyport MA at 7 on Friday October 30. We always talk about a Reds party--now it's on! SUSAN: So, Reds and lovely readers, what makes a great party? Would you rather be a host or a guest? What was the best party you've ever been to? Let us know in the comments! Happy Book Birthday, Susan! I am so looking forward to reading this book . . . I like being the hostess for family get-togethers and celebrations; I'd be petrified to do a large party, though. Thanks for the recipes; now we'll have to have our own martini-tasting. Congrats on the new book, Susan. Looking forward to reading it! Happy release day, Susan, and what a wonderful way to celebrate. Best party ever? Hard to say, but would have to be one when I worked for Miami City Ballet. Princess Cruise Line had a christening party. There must have been some Florida connection I have long since forgotten. Both Audrey Hepburn and Captain Stubbing were there. Can't beat ship's food, it was wonderful, the band was great, and the company even more fun. It's a bit early to try the Churchill/Roosevelt martini contest for me, but all those cocktails from the 1940s and 1950s, they all sound so yummy. Wouldn't it be a great idea to have a vintage drinks party--have to make it an overnighter though. No driving. Yes, Susan, I'd love to hear more about your gorgeous gorgeous covers! What did you think when you saw the first one! And how did they come up with that wonderful style? On to Madison Wisconsin ! See you in a little while--Susan where are you? Congrats on the wonderful new book Susan! and thanks for letting us look in on the martini party--probably better for me to watch than drink:). Hank and Susan, more than grateful that the local B&N had Mrs. Roosevelt on Sunday. It is indeed a "gorgeous" book...and the words demand to be read. I'm reading much to fast, but love be carried and pulled along. Thank you, Susan. Have fun with your launch! Yes, indeed, 8 am is too early for Martinis. but it's five somewhere, right? Like Lucy, it's probably better that I watch. The only martini I've ever had that I truly enjoyed was a chocolate martini at Bouchercon 2012 in Cleveland. And I shudder to think of what Churchill would have said about that! I love to host a party. And one MUST have a signature cocktail for each party - it's a rule. I may even host a pre-Bouchercon wine event in NOLA - since we have rented a housing complex with a private courtyard. As for the martini, I am just not a fan. I do love a flavored-martini (appletini, chocolate martini, lemon drop), but if I am going to go old-school, I much prefer a gin and tonic or a mojito. Congratulations on the new book Susan! Enjoy your launch week. Mary Sutton, I can't believe we missed one another in Cleveland. Did you have your chocolate martini at the chocolate restaurant up the street from the hotel? Lots of conference-goers were there. The first martini I ever had I didn't realize it was one. Dinner companions were having Absolut on the rocks with a twist, and I asked for the same thing (I never know what to order, too many choices). Not a fan of gin, but the vodka martini won me over. For a while my oldest daughter was drinking grape vodka and soda, but it tastes too much like fizzy, watered-down alcoholic grape jelly to me. Oh, yes, Kristopher, to signature cocktails! The best party? Hard to say, but friends had one at their home that included a band, fronted by the host. They parodied "We are Family", complete with Sister Sledge costumes. It was hilarious. Many years later they hosted another party, for our friend's 60th birthday, on the rooftop of a downtown building. They "got the band back together" for the entertainment, but also invited other friends with musical talent to jump and perform with them. I have to say both those parties were incredible. Someday all the Reds are going to manage to be at one mystery convention or book conference together, and when we are, I vote we host a cocktail party for all out friends! I'm excited for you, Susan. I loved this book! A guest gets to enjoy things. A host has to make sure things keep going and the food and drinks are there. Karen, yes - that's the one. The Chocolate Bar? We went back several times on that trip. I can't remember three years ago - was I such a regular commenter then? Of course, that was my first big convention event, so I was much more shy about introducing myself. Rhys was kind enough to talk as we waited in line at the Rock & Roll Hall of Fame. It's Churchill's for me! (I love the bow towards France:-)) I love olives, but in drinks, only in a Bloody Mary. My only issue with a Churchill Martini is that I don't drink fast enough (that's a lot of alcohol to gulp) and it gets warm. So I prefer a really good gin over ice with a big twist of lime or lemon. Host or guest? Hmmm. That's even, I think. I like hosting because I like the planning, the special drinks, the menu, etc. But it's very seldom as a hostess that you get to sit down and really enjoy yourself. I'd like to be a guest at Susan's Martini tasting party! And, yes, REDS cocktail party! Susan, entertaining martini tasting! Thanks for the notes. I can't wait to read the latest Maggie Hope. Enjoy your trip. If you need another Reds cocktail (didn't you guys come up with one a couple years ago? ), I vote for a Sazerac. So elegant, but it packs a wallop. And it's sort of red from the Peychaud's Bitters. Oh Kristopher, I love the idea of a pre-NOLA event! That would be a blast. And, Susan, yes, a Reds cocktail party! Bring on NOLA! Now, martinis ... I just don't like them--I'm in the Kristopher crowd on this one. I don't know what it is, because I like gin just fine. But if I had to choose, I'd need the extra stuff in the gin -- so FDR's version would probably be better. Bee's Knees? Now that I'd gulp down. Hosting? Hmm ... I'm a nervous host -- always worrying -- but I can do it. How about co-hosting? I like that. Reds cocktail party! I'm in! ANd yes, we had a signature cocktail: the Bestseller. Bestsellers for EVERYONE! Susan is coming to Boston this eek, so we will see what we can concoct, right? And I'd rather be host than guest. It's complicated, but it gives me a role. Is that weird? Karen in Ohio--Sazeracs are strong! You are so brave.. I'm with Debs on this one. Olives and gin shouldn't mix. Given I'm a Londoner I'm sticking with Winston but either one would be welcome right now. Raising a virtual martini glass and wishing Susan a happy launch day! And yes, we must serve "The Bestseller" — 'Why, yes, I _would_ like a Bestseller, thank you very much!" I had a rough night, sick, up and down. I slept in, really in. I wasn't feeling great when I got up, but better, and then, I suddenly felt like a million bucks. That's because, Susan, Mrs. Roosevelt's Confidante was delivered to my door. Talk about taking the sting out of a bad night. I have it sitting beside me now so that I can continue to gain sustenance from it. I do have a book to finish first, but, like taking a favorite stuffed animal around with you, I will be keeping MRC beside me whether I'm in my reading chair or in bed today. You might not have realized how therapeutic your book is, Susan. Congratulations on your book birthday, and what I know will be much success with it. Martinis? I'm with Kristopher and Lisa. Not a fan, although as little experience as I have with them, that might not be a fair statement. But, I love the idea of signature cocktails for events, and next year in New Orleans provides the perfect platform for those. Kristopher, I'm pretty sure your place is going to be rocking the whole week, and I can't wait to participate! A Reds cocktail party? Woohee! Bring it on! Oh, I'm also not a fan of green olives, so I'd have to do something about that in a martini. I guess, like you Hank, ordering them on the side is a good option. Hosting or a guest? I like hosting because I love doing theme-related activities, and I enjoy doing special little touches that people aren't expecting. However, being a guest is great because you don't have that pressure of making sure everything goes just right. I guess I'm split on this decision. Congratulations, Susan, on Maggie Hope #5; I'm "hoping" by book #7, you'll be touring in California, northern or southern, doesn't matter. I'll make it there. Thanks also for the martini recipes. I LOVE olives so I'm guessing I'd like Roosevelt's martini more than Churchill's, but I also like the idea about Churchill's for summer, Roosevelt's for winter. Host or guest? No question, I'd rather be a guest. I only feel comfortable hosting for family. Reds cocktail party in New Orleans: fabulous. Confession: I've never had a martini. But I can see I need to make up for lost time. What I have done is read Maggie Hope books and can't wait to read the new one! Congratulatinos, Susan! I'm with Churchill on this one (although I'd go with a cocktail onion for a Gibson) unless it's Aviation Gin from the NW, in which case I'd go for a twist. Mr. Roosevelt's version is, in my opinion, a waste of good gin. Best mixers for gin: either tonic or rickey-style with lime juice and seltzer. Congratulations, Susan! As I wait for Maggie and Eleanor to arrive, I'm toasting you with a Warm Springs Martini. That's a Roosevelt sans ice.